Armagh manager Kieran McGeeney has confirmed that star forward Jamie Clarke will not be part of the Orchard football squad this year. Clarke told McGeeney he will return to the United States after Crossmaglen's All-Ireland club campaign ends. "I was chatting to Jamie and he has indicated he is gone for the year," said McGeeney. The news is a huge blow to Armagh's hopes of making a major breakthrough this year after a disappointing 2015. 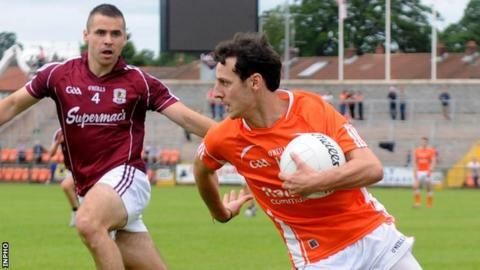 Although they gained promotion from Division Three of the Allianz League last spring, Armagh failed to build on their 2014 All-Ireland SFC quarter-final appearance in a summer which was cut short by defeats by Donegal and Galway. Clarke was part of their short-lived championship before spending the rest of the summer in New York. He returned in October, coming on as a Crossmaglen substitute in the wins over Kilcoo and Scotstown as the club won the Ulster title. He is committed to their bid for a seventh All-Ireland title, which begins against Castlebar Mitchells on 13 February, but McGeeney is now resigned to being without the mercurial forward. Several of Crossmaglen's contingent, including Tony Kernan and James Morgan, are expected to return to Armagh later this year. "When you ask a player, they have to want to play for the county," said McGeeney. "Hopefully they'll go on (and win the All-Ireland) because it always helps to have winners on your team."